All-in-one screen and easy-to-use hotkeys make the 619 an ideal tool for the DIYer and professional technicians alike. Extended cover connections to maximize protection will allow this unit to last through years of constant use. Works on ALL 1996 and newer OBD II & CAN domestic or import vehicles. 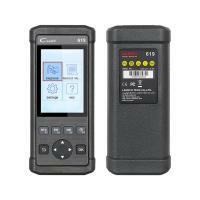 CR6011 provides the ABS and SRS diagnostic functions, Read DTCs, clear DTCs, and read data streams for the ABS system and the SRS system. Works on 46 car models, see the description for more models. Free update via the internet, Multilingual Support. 10. With the same functions as AUTEL AL619(USHKSC178). All cars that suport OBDII, from 1996 to present (American cars), 2002 to presen (European cars). 1. Go to the official website of LAUNCH "www.dbscar.com", click "Products" ->"creader 4001~9081"; find the "creader 6001", then down load the update tool to your computer. to your PC), click the update. Please keep the device connected and ensure the network works well.